If you are looking for a perfect accommodation to spend a wonderful vacation with your family, there are family condos in Branson that you can choose to experience awesome stay during spring season. Whether you want to stay in a condo that is near the golf course or near the lake, Thousand Hills Golf Resort will let you experience luxury, comfort and complete relaxation not found in regular hotel accommodation. 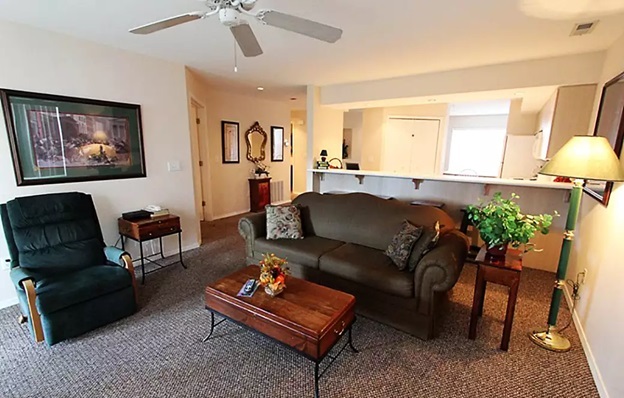 Beautifully nestled in a secluded area but actually near the city, the family condos in Branson are fully furnished with high-end amenities such as cable TV with HBO, free wireless internet access, and DVD player. These Thousand Hills condos are also equipped with modern appliances that include fridge, microwave oven, washer/dryer, dishwasher, pots and pans, and kitchen wares and utensils. While you are spending a great vacation escapade at Thousand Hills Golf Resort, you can always have the chance to enjoy your stay as the place features activity center that offers board games, arcade games, pool tables, and a bunch of DVDs to borrow. The great location of Thousand Hills condos near the most popular 18-hole golf course in Branson will allow you to enjoy a panoramic view of the beautiful landscape of the course in a rustic wooded settings. The condos of Thousand Hills golf Resort in Branson comprise ten four-story buildings. Each building has 8 condo units that add up to the lake front and golf front condo projects of the resort. Each condo building of Thousand Hills offers first class amenities, indoor and outdoor facilities that include 7 pools, fitness center, tennis court, elevator access, and free parking. Staying at Thousand Hills condos in Branson gives you the chance to enjoy luxurious and comfortable way of home living where you’ll find it hard to experience in any Branson area. With an area of 4 acres, this golf resort in Branson gives you a chance to take a peek of the beautiful fairways and fascinating greens of the 18-hole golf course. Unlike regular hotel accommodation, your stay at Thousand Hills condo will give you the chance to feast on the beauty of nature along with the picturesque rolling hills, wooded valleys, the lakes, and the spectacular Ozark mountains. Your spring vacation in Branson will not just be wonderful but a memorable one because of the excellent atmosphere that you will feel in a calm environment which make you forget noisy city streets. While Branson boasts countless theaters, you might be interested to watch a movie or world-class live entertainment shows performed by world famous entertainers. After you have enjoyed exciting activities around Branson, it would be great to shop and dine around the area. In the heart of Branson, you will find tons retail shops, variety of retailers, and specialty shops making this vacation spot a shopper’s paradise. So, if you are going to spend a wonderful spring vacation in Branson with your family, secure an awesome stay at Thousand Hills condo.